When you watch as many videos as we do, you eventually start to take notice of some pretty unique spots and setups that keep popping up in videos. Over time, we have seen a handful of videos from Justin Schwanke that has featured his crazy backyard ramp setup out in Alberta, Canada that has been pieced together over the years from skateparks that closed down, events that no longer happen and whatever wood him and his friends could come across. We were curious what the story was behind the setup and figured it would be cool to get in touch with Justin to talk a little bit about his backyard BMX paradise that he calls home! We even have a brand new video giving us a little tour to go with this that you can check out above! After you watch that, check out the interview after the jump! Years riding: I started racing at 6 years old and was jumping off mounds of dirt about a year before that, so I guess that puts me at about 15 years of riding BMX. Crazy to think it’s been that long. Sponsors / Hook Ups: Mom and dad, the best sponsors anyone could ask for. So, Justin! We have seen a few videos from you in the past and your backyard always caught our eye. How long have you been building your private paradise? The backyard setup began to take shape around the same time I started riding. I’ve lived on an acreage my whole life. Out here if you’re a kid who is too young to drive into town to the skatepark and can’t get a lift from your parents, you basically ride whatever you build. We would imagine it has evolved quite a bit over the years. How often do you like to change things up or add new things? The backyard has gone through a lot of phases. My dad and I would build ramps together at first. I then started digging quite a bit and made some small dirt jumps. Over time the features grew in size and number, but the first serious change came when a local indoor skatepark in Thorsby closed down. Long story short, we were able to have all of the ramps as long as we removed them from the building. It was a big project because the ramps were originally built indoors. The doors of the building were very small so almost everything had to be taken apart. We then needed to transport them home. It was definitely a bittersweet experience. 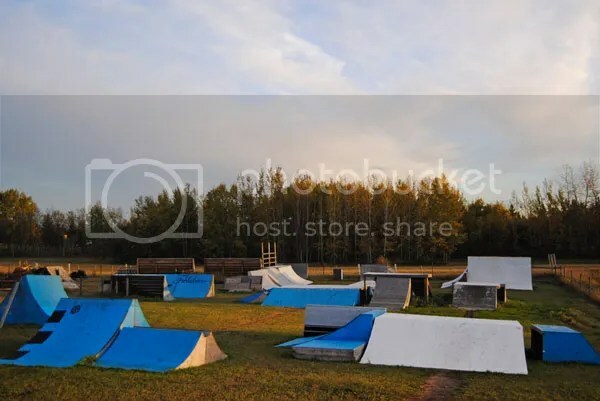 I was obviously stoked to get my own backyard skatepark, but at the same time it was sad to see an amazing park like Thorsby officially shut its doors. In the end, we kept a bunch of the ramps, gave some to friends, and then sold a few others. The next transformation came about a few years later when I got a call from Bernie at 1664 BMX who was getting rid of some old contest ramps. The Street Justice contests used to be held in Edmonton and were eventually replaced with another contest in a different town. The Street Justice ramps had been sitting in storage for a number of years. Similar to Thorsby, we could have as many ramps as we wanted as long as we transported them. We ended up taking about half of what was there. These two projects have helped to make the backyard evolve to where it is today. Overall though, it’s always nice to change things up whether it be building something new or moving pieces around. Variety keeps both life and riding interesting. What are some of your favorite features in the yard? My favorite feature, and probably the favorite of almost everybody who comes out to ride is the main box jump line. There’s a small tabletop, a kicky box jump, and then an eight foot quarter at the bottom of the hill. This line seems to get ridden the most. It’s fun to not only just float around on, but also learn new tricks. Second best for me is the big blue pyramid. It’s good for goofing around on with nibbly tech moves. Do you have any plans for some new additions once the weather warms up in Canada? We have a 7 foot half pipe that needs to be set up; flat bottom and all which will be nice for those who despise riding on the grass/dirt, Haha. It was donated by a fellow rider in Edmonton who was selling his house and could no longer keep it. I’d assume your family is pretty supportive of you riding BMX since they let you have all this space to work with! What do they think about you riding? My family is awesome about it. They realize how much BMX means to me and like to support my passion. My mom is cool with what we do and usually doesn’t give us too hard of a time, unless of course someone gets hurt. My dad is pretty much the reason the backyard exists. He built me my first ramp, a 2 foot tall launch ramp, when I first started riding. Since then we’ve built many more together. He has also helped me in transporting and setting up everything else that we have acquired. My brother’s interests have since shifted away from BMX, but he definitely lends a hand too. I know in the edit you dropped in this, it’s pretty clear you have developed a unique style of riding that caters to what you have around you to ride. Do you feel like your riding has evolved with the spot? Yeah, I’d say so. 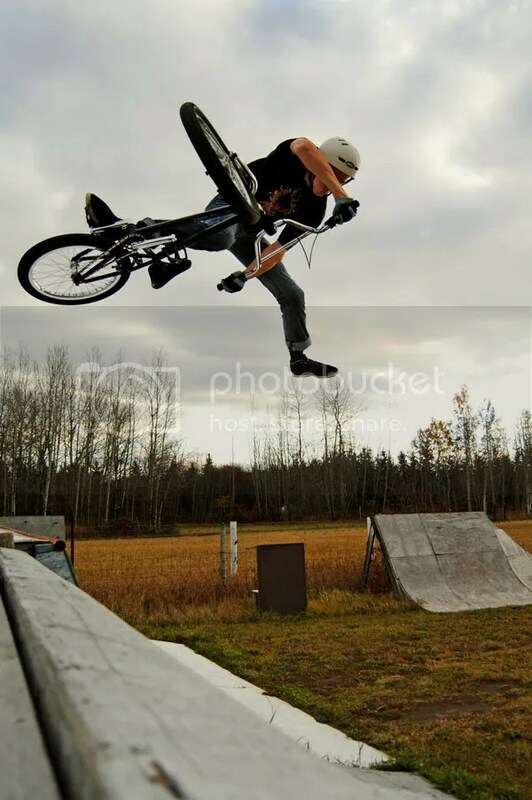 Before I got my license I’d ride race tracks and the occasional skatepark, but I’d mostly just be out in my backyard. When you’re riding the same spot all the time, it makes you think creatively to keep things fresh. The same thing goes for small town kids and their home parks. My racing background has also played a part. When you’re not riding on concrete or smooth dirt, such as is the case in my backyard, you have to pedal a lot. So yeah, it doesn’t bother me to work a little harder by pedalling a bunch and pumping transitions to keep speed. I have a second bike with trick sticks on it, but for the most part I consider myself a pegless rider. There’s nothing really to grind in the backyard as far as ledges, especially since there’s no concrete to coast on. So that, coupled with my race background, caused me to avoid pegs for a long time. It looks like you use a lot of random pieces and scraps to build your setups. Do you feel like that has been a bit of a benefit as far as getting creative goes? I’ve used all kinds of random materials to build with in the past. Oil barrels, rubber mats, carpets, and an old deck from a school are just some of the items that come to mind. In recent years I’ve noticed there’s been a lot of discussion about “setup style street riders” who are able to adapt to unusual spots and come up with original ideas. I think the same kind of concept applies to building. Whether it be modifying an existing setup, or building from scratch to create something new, being imaginative and resourceful is key to fostering creativity. Let’s say you got a huge budget to build a dream setup. What would you have in that space if you could start over fresh with all new wood and everything? I would build some stuff similar to what we have now, but there’s certain features I’d like to add. First and most important, I’d put everything on top of a concrete pad so we don’t have to ride on grass/dirt and dodge gopher holes. Ha ha. I’d love to build a big hip, about 7 feet tall with a mellow landing. I’ve always enjoyed kicking out the bike over a nice hip. A step up with a flat landing would be neat for learning tricks too. Ledges, manual pads, stairs and small banks would be icing on the cake to add some tech variety. Is there much of a scene where you are from? Do you have a few people to share your setup with? Yeah, the Edmonton scene is thriving. It’s a 30-45 minute drive from where I live. There’s lots of riders and we also have an awesome shop, Transition BMX, which seems to glue the scene together. There’s five big concrete parks in Edmonton alone, not to mention many more in the surrounding towns. Street spots are fairly decent, and there’s some dirt jumps if you’re well connected or are down to ride the mountain bike parks. The only thing we could really use is another indoor park since there aren’t any left in the Edmonton area. I have a close group of friends who come ride quite a bit. Although I’ve been known to do a lot of solo sessions, it just wouldn’t be the same if I didn’t have a place like this to share with good people. Do you ever throw jams? How could somebody go about getting a session out there with you? Nah, unfortunately we haven’t held any jams. It’s tough with liability and everything if someone were to get hurt. My parents are always a little hesitant about letting people they don’t know come ride. Nonetheless, I’m still often inviting new people over to shred. What do you do to pass the time when the snow is on the ground? Do you have any local parks or are you out there shoveling so you can get a session in? Winter here is usually 5-6 months long so it’s pretty grueling. The closest indoor park is a small one about an hour and a half away. I’m fortunate enough to have a couple of ramps indoors to ride here at home. My dad was willing to relinquish some shop space so that I could ride year round. 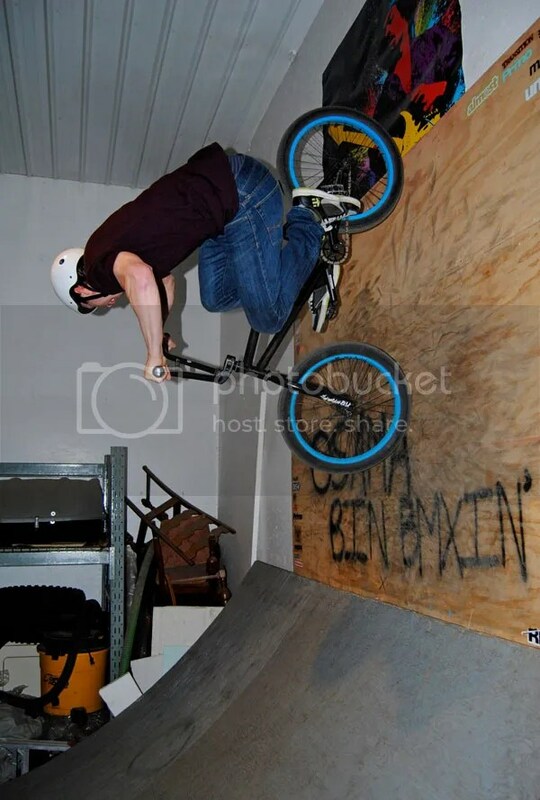 When you’re in a confined area riding the same setup for months on end it definitely forces you to get creative. It’s always neat to see what my friends and I can come up with. Other than that, I usually catch up on the overload of video footage and photos I log throughout the snow-free months. I used to snowmobile and go to the local ski hill with my snowbike quite a bit, but every year I seem to have less motivation to go outside in the winter. I usually take off somewhere warm on my winter break between semesters. One day I’ll definitely be leaving the snow and cold behind permanently. How can people keep up with you and your yard? Are you on Instagram or anything? I’m not too well connected with social media, but I am going to be improving that flaw very soon. I’m working on a small brand called Weird & Revered. I would really appreciate it if whoever is reading this could go give our Facebook page a like: Facebook.com/weirdandrevered. In the near future, that’s going to be the best way to keep up with what I’m up to and what’s going on with the backyard. I’m finishing up a lengthy promo video which will certainly have some backyard clips included. It should be out quite soon and that will be the official launch of everything. I don’t want to give away too many details, but we’re definitely going for something different. Aside from Facebook, people can check out my Vimeo channel: VIMEO. I’ve been making videos for a number of years now so there’s a lot of old content to sift through if you’re looking for some entertainment. I’m incredibly grateful and have a lot of people to acknowledge. First and foremost, I have to thank my dad. From building that first ramp to tackling big projects such as deconstructing the Thorsby park and transporting the Street Justice ramps, he has been there every step of the way. Although he understandably gets annoyed with me at times, it’s amazing that he continues to be this supportive of my love for BMX. Much thanks to my mom for tolerating the ramps all over her yard. No thanks to the few neighbours that think our backyard is an “eyesore.” Thank you to the Village of Thorsby and Bernie at 1664 for hooking up some serious additions to the backyard playground. As well, thank you to Jordan for the half pipe. Thanks to my brother and all of my friends for helping out with transporting and building ramps, and providing constant entertainment atop two wheels. Lastly, thanks to you Kurt for this interview. I guess the main point I want to make is just for people to get out there and build. I realize how fortunate I am to have the land to build on and the opportunities that have arisen to acquire more ramps. Few are lucky enough to have that. I get that. However, it bugs me when people complain that they have nothing to ride. Whether it’s digging in the woods, getting creative with pallets, or building a grind box for driveway sessions, one can always make something new to get stoked on riding bikes.